Nature has it’s way of telling us what we need. Our bodies do too with certain cravings and desires. When your body is craving some chocolate, perhaps you just need magnesium. Maybe you really want some red meat, and you find out you are iron deficient. In the summer, you find yourself eating more fresh fruits and vegetables because they are plentiful. Everything happens for a reason, and this time of year, we see it yet again with citrus. I notice myself craving citrus in the winter because my body is trying to tell me it needs that source of vitamin for overall health. Start the day with a cup of warm water and lemon, or add some grapefruit to your breakfast. Try to get it from an organic food source, as that is always the best option. If not, you can supplement, just make sure you do your research before hand. 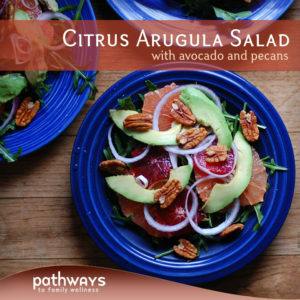 Need some other inspiration on including citrus in your diet? 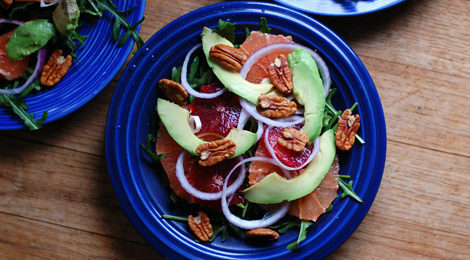 Try this salad that has the perfect blend of sweet and spicy, tangy and nutty. It will be just the boost you didn’t even know you needed, or maybe you did because guess what? Our bodies are amazing, intelligent organisms which tell us exactly what they need to thrive. Start with arugula as the bedding either in one bowl or on several serving plates. Top with sliced citrus fruits, sliced red onions, sliced avocado and pecans consecutively. Drizzle with olive oil and add salt and pepper. *Refer to this video on how to easily cut off the peel and pith from the fruit. You can then decide if you want to slice into rounds or into quartered chunks like they do. I am writing “organic” not because I am being facetious but because that food will have more vitamins and minerals than non-organic. It’s always best to choose organic when possible. Refer to the dirty “dozen” list to determine what is most important to choose organic; notice a lot of them are fruits!